Stars: Peter Ferdinando (Tony Benson), Neil Maskell (Mike Hemmings). This, then, is the first in a potentially recurring series of essays on films suggested by other people. Whether this works out or not, I don’t know, but for now here’s a piece on dank serial killer portrait Tony. 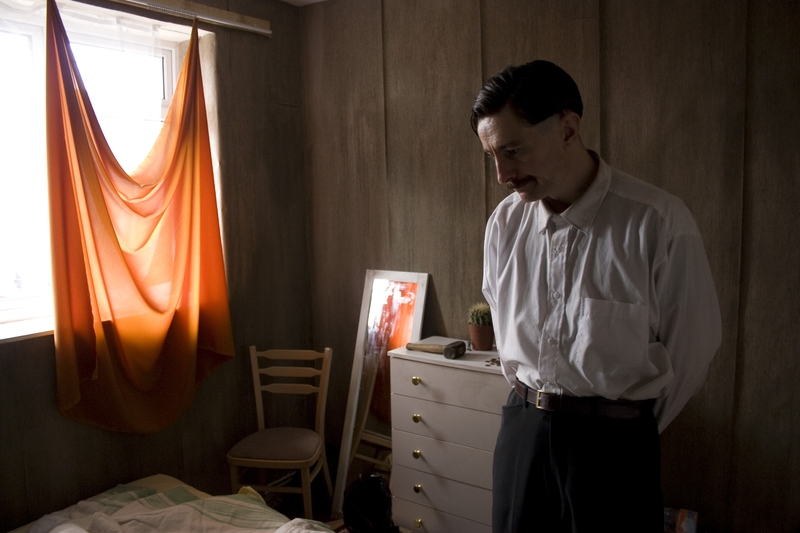 Made with National Lottery funding and having skulked fittingly under the radar of general consciousness, Gerard Johnson’s Tony is a particularly British depiction of a murderous pariah nestled in the dreary futureless council flats of Dalston. Peter Ferdinando plays the titular menace; gaunt, bespectacled, socially enfeebled to a fault. One might almost assume him a not-so-distant relation to Ralph Fiennes’ mumbling protagonist in Cronenberg’s Spider. And while that movie is not one of Cronenberg’s finest, it displays loftier ambitions than those evidently earmarked by Johnson for this ugly character piece. Embellished from his own short film, yet still only clocking in at just over an hour, Tony depicts a society of decline with almost no shades of colour or charity. It’s a drab, unrelentingly dour tour of disheveled telephone boxes, poky gated flats and pubs inhabited by unsavoury rejects from The Jeremy Kyle Show. At the epicentre of this inauspicious arena is Tony; shy, mild-mannered, totally useless at conventional social engagement. He’d be pitiable if it weren’t for his occasional bouts of murderous violence and proclivity for keeping the bodies of his victims for company. This latter trait ties him loosely to the backward central figure of Cormac McCarthy’s Child Of God, and one can, at a stretch, see Johnson trying to evoke a similar level of pathos in Tony. There’s evidently a pathology at work here; a man desperately trying to gain attention and acceptance within the limits of his control. Tony’s victims become mannequins with a sell-by date; his relationship with the corpses isn’t exactly sexual (though there’s a hint that they might be), but they become matter of fact as soon as it comes to disposal time. What created him? The film seems uncertain where to lay blame (not a bad thing). A frequent point of concern is Tony’s keenness for watching videotapes of gaudy third-tier 80’s action movies on a portable television set. You initially wonder if Johnson is going to open up a conversation about the effects of screen violence on an impressionable mind, but the more they appear the more this element of the story seems like a running joke, or, more aptly, that Tony’s development is as arrested as his acknowledgement of cultural and technological advancement. Tony never apes his bombastic heroes. In cinematic terms, his ancestors are the villains of Henry: Portrait of a Serial Killer or the original Maniac. Unfortunately Tony isn’t nearly as intense or memorable as either. Johnson’s failings are largely tonal, as he can’t seem to decide whether we’re supposed to feel awkward sympathy for Tony, like some modern-day Norman Bates, or if we’re to outright laugh at him. As the film openly craves appreciation as a ‘gritty’ depiction of impoverished inner city life and unchecked psychological upset, it also plays for clownish laughs (see the scene in which Tony tries and fails to leap a low gate, for example). These cringe-comedy moments – which extend to Tony’s frank inability to keep up in a simple conversation – feel as though they undermine any genuine attempt to approach his illness seriously, yet conversely provide some of the film’s only moments of respite from the unblinking joyless rot of the world. Similarly the sole attempt to explain away how society has let Tony exist and ‘thrive’ lazily points to incompetence within the system that ought to be looking out for him, embodied by Neil Maskell’s wideboy Job Centre employee Mike. It’s not a total loss by any means. Ferdinando puts a lot of work into his lead performance, crafting something unnervingly believable even as the script veers into serial killer cliché (confused escapades at a gay club? ), while the vision of London’s suburbs as a wasteland of forgotten people prickles with a grim level of honesty. As already suggested, there’s also an (un)healthy streak of black humour to Tony, its darkest depths come during a mortifying visit to a local prostitute, whose sad price list is stuck to the bedroom wall and marked with lipstick kisses. The ending, meanwhile, is commendably eerie, playing against expectations and leaving the viewer to consider which of the strangers they pass in the street might be hiding lethal psychological wounds. Johnson isn’t without talent, and as a debut picture Tony screams with potential. His follow-up feature Hyena is released in the early part of 2015 and I can consider my appetite for it whetted. But that equally comes with the hope that he has grown as a filmmaker and found a balance between merely depicting the ugly and finding a level of depth within such tragedies swirling in society’s gutters.